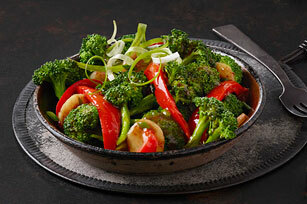 Mix broccoli, red pepper and more for a colorful Stir-Fry Vegetables dish. Flavor Stir-Fry Vegetables with tasty steak sauce, soy sauce and lemon juice! Heat oil in large skillet or wok on medium-high heat. Add broccoli, peppers and onions; stir-fry 8 min. or until crisp-tender. Stir in remaining ingredients; cook 3 to 5 min. or until heated through, stirring constantly. Reduce oil to 1 Tbsp. Toss broccoli, red peppers and onions in oil in 2-qt. microwaveable bowl. Microwave on HIGH 5 min. Stir in remaining ingredients. Microwave 2 to 3 min. or until heated through, stirring after each min. Let stand 5 min. before serving.